Happy St. Patrick's Day! 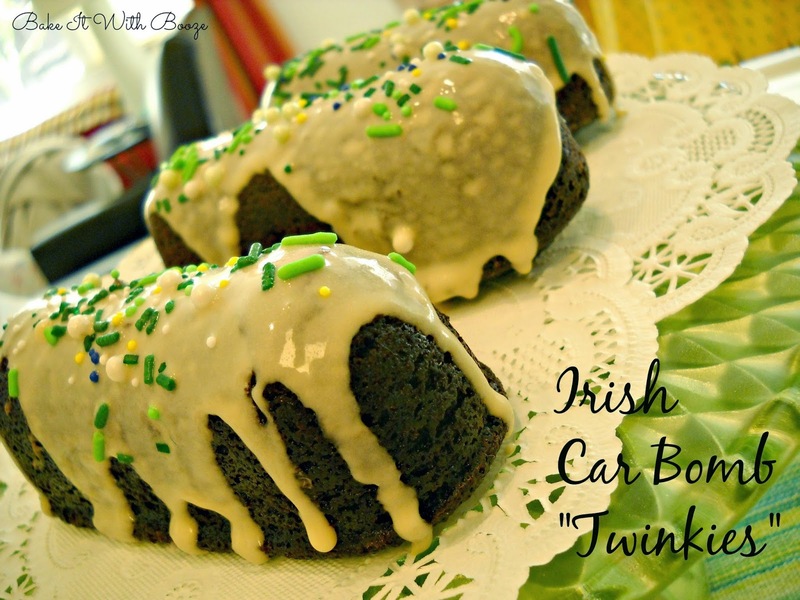 Irish Car Bomb "Twinkies" are the perfect end to your corn beef and cabbage celebration! These are made very similar to the cupcake varieties that you see on the internet with some adaptations: chocolate stout cake with a creamy chocolate whiskey filling and topped with an Irish cream glaze. A little bit dressed up and little bit down home. I've had these on my baking bucket list for a long, long time. I had wanted to make the cupcake version, but when Hostess announced that they would be closing up shop on Twinkies, I had to get the pan to make homemade Twinkies. The pan is called a "cream boat" pan. So, technically, these are Irish Car Bomb Cream Boats. No copyright issues there...And, if you remember, Jacqueline posted her delicious version of Grown Up Twinkies with Rum a while back, too. Moist chocolate cake that holds its shape well and can handle the filling of chocolate whiskey marshmallow cream. Lots of great chocolate flavor in this beauties. Once these are filled, they are topped with a Irish cream glaze. Booze of choice for these are Tullamore D.E.W. (no surprise! ), Baileys Irish Cream and Bison Organic Chocolate Stout. Irish all around and I wouldn't do these any other way. This was sort of a trial and error process for me. I tried to cheat and didn't prepare the pans with shortening and flour. Well, I sure learned my lesson and now have 14 'rejects.' Not very pretty but taste great. Good news is that the second attempt was a success. So, if you try these, prepare your pans the old-fashioned way or you will have lots and lots of chocolate cake crumbs to make some trifle or cake pops. Trial and error aside, I will make these again. Now I know all their secrets and am excited to try different versions of Twinkies for adults! Hope your St. Patrick's Day is grand!